What is a Ruby? A GEM! Around the world, many women are working to improve the lives of women and girls. Some women work to improve conditions for women and girls through their personal or volunteer efforts; others do so through professional avenues. The Soroptimist Ruby Award, formerly the Soroptimist Making a Difference for Women Award, is designed to honor these women. 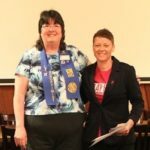 Although not Soroptimists, their work helps promote the issues that are important to Soroptimists, while offering inspirational stories about how to make a difference in the lives of women. The Soroptimist Ruby Award honors the first federation President Ruby Lee Minar. Ruby is also a gemstone associated with wisdom, importance, vitality, strength, power and love: All words embodying the award recipients. This award honors women who are making extraordinary differences in the lives of other women. Examples would be a woman who helps to establish a domestic violence shelter, a woman who starts a mentoring program for at-risk girls, or a woman who lobbies her company to provide on-site child care. This program will give the club and the entire organization the opportunity to say “thank you” and encourage others to explore ways to assist women. A woman in the community who is improving the lives of women or girls through her professional or personal life. By identifying and focusing on a need of women and girls, this woman has contributed to the improvement of their lives. Although clubs may honor a woman for a lifetime of good work, the majority of the work should have occurred within the past two years.